Sidney Janis Gallery, New York (acquired directly from the artist in 1954). Count Alessandro Panza di Biumo, Sr., Milan (acquired from the above in January 1961); sale, Sotheby's, New York, 2 May 1985, lot 56. W.C. Seitz, Abstract Expressionist Painting in America, London, 1983, no. 225 (illustrated). Houston, Contemporary Arts Museum, Mark Rothko, September-October 1957, p. 11. Venice, Palazzo Grassi, Arte e Contemplazione, July-October 1961, no. 31 (illustrated in color). Bari, Pinacoteca Provinciale, Aspetti dell'Informale, January-February 1971, no. 74. 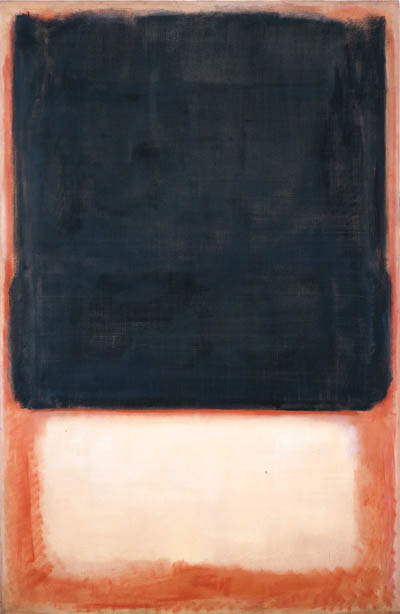 In 1950, at the age of 28, Mark Rothko found a motif and method of painting which he was to use until his suicide in 1970. It was, in Harold Rosenberg's words, "the conclusive insigne of a disembodied absolute. This icon consisted of the rectangle of the canvas as a one-color ground visible along the edge of--and occasionally through an opening between--three or four horizontal blocks of color with brushed surfaces and furry borders. For the next twenty years, Rothko's work consisted of reanimating this pattern with the substance of his emotional life" (H. Rosenberg, "The Definition of Art," in D. and C. Shapiro, Abstract Expressionism, A Critical Record, Cambridge, Massachusetts, 1990, p. 413). He used thinned oil paints, reminiscent of the watercolor medium with which he was so adept, applying them in many layers to create glowing, evanescent colors (figs 1 and 2). The present painting has a sensuous, natural quality that is replaced by a brooding melancholia in the later dark works, a joyful vitality that it has not lost in nearly fifty years since its execution. Rothko described the use of simple flat shapes as bearing a kinship with primitive art and myths, often retold through Jungian psychology: "We seek the primeval and atavistic roots of the idea rather than their graceful classical version; more modern than the myths themselves because we must redescribe their implications through our own experience" (in a radio broadcast in October 1943, quoted in D. Waldman, Mark Rothko, A Retrospective, New York, 1978, p. 270). He constantly sought the dramatic and violent in his work; and through the format of usually upright human-scaled canvases which were big enough to envelop the viewer, he used the simplest of forms to convey universal emotions. (fig. 2) Mark Rothko in his studio, before No. 25 (1951), circa 1952.